The Garmin Vivoactive 3 is just as comfortable being a high-end activity tracker as it is being your daily fitness tracking wearable. In this regard, it's comfortably one of the most versatile smart fitness watches around. It's not perfect, but it is very good. Garmin is well known for producing highly regarded wearables, specifically those for tracking sports activities. Whether you're a runner, cyclist or general outdoors lover, there's a high probability you've already purchased or considered purchasing a Garmin watch. If anything has held you back in the past, it's likely been the price, as the high-end Forerunner or Fenix series don't come cheap. Which is where the new Vivoactive 3 comes in: it promises to be a wearable that can compare with the likes of the Fenix 5, but in a device that costs almost half as much. Is the Vivoactive a truly great multi-sport smart sports watch for sub-£300? Despite its more budget-friendly price, Garmin has kept materials and design features pretty high-end with the Vivoactive 3. The round bezel around the screen is made from stainless steel and has lines engraved around the circumference to denote the hour positions. The main body, at 11.7mm thick, isn't anywhere near as big as its sibling, the Fenix 5. The Vivoactive's case is also built from fibre-reinforced polymer, just like the Fenix. It's also designed to be water resistant to 5 ATM, or 50 metres deep, and has Corning Gorilla Glass 3 covering the watch face. While some other smart and sports watches have multiple physical buttons on both sides, Garmin has opted for just one in the Vivoactive 3. This is perhaps the biggest indication that the Vivoactive is going for the simple-but-functional fitness watch approach. Instead of multiple buttons for extra and exacting controls, there's a touch-sensitive panel on the left edge, as well as a touchscreen for interacting with the watch. We think this design decision will be divisive; some users will love it, others will hate it. Those who are used to traditional sports watches and being able to just press a button while working out to set a lap, or skip through different screens to few different data won't like trying to use a touchscreen while exercising. The touch panel on the Vivoactive 3's left edge reduces this frustration somewhat, but at the same time it's too easy to brush it accidentally. On the underside of the watch you'll find some now-standard Garmin features, including a metal base with a built-in optical heart-rate sensor. Above that is the proprietary Garmin four pin charging connection point. As for the all-important strap, here's one area you can tell Garmin saved a little on costs in the Vivoactive. It's a slim, 20mm strap which feels a little cheaper and slightly more crude than the straps you might get on something like the Apple Watch or even the Samsung Gear Sport. Still, with it being a standard size, and with a quick-release mechanism, it's easy to swap it out for something better. What's more, the included strap is fairly stretchy and has holes for the clasp almost all the way up to ensure it'll fit virtually any wrist, regardless how big or small (officially it can fit wrists between 107 - 204mm in circumference). As you'd expect from a watch made by Garmin, the 1.2-inch round display on the front is a fairly basic affair, but for two very good reasons: battery life and daylight visibility. It's a colour transflective e-ink screen, similar to what's found on virtually every other Garmin watch. Its resolution of just 240 x 240 pixels is some way short of what you'll find on more traditional OLED and LCD based smartwatches, meaning you're not going to see super-sharp lines or smooth curves here. Being transflective means that ambient brightness is sufficient to make the watch face visible. In fact, the brighter the light, the easier it is to see. In other words: it doesn't need a backlight throughout the day, unlike the LCD and OLED panels you get on "traditional" smartwatches. However, this screen type means you don't get smooth animation. By nature, this type of screen has a low refresh rate, and so they can appear stuttery. It's no smartwatch rival, nor is it meant to be. When it's dark you'll need the built-in backlight to see the watch face. This works more like classic sports watch backlight, delivering a cool white, almost blue illumination that comes on when you tap the screen or raise your wrist. One frustration we found a couple of times is that this can happen at night when you're sleeping. A couple of times during testing, we woke up because we'd moved our arm and accidentally activated the backlight. Being this kind of e-ink type display means that the watch face is always on, so you can always see the time. It also doesn't consume very much energy, with a battery that lasts a lot longer than the usual one to two days of a smartwatch. Although the Vivoactive 3 isn't as fully-featured as the Apple Watch or even Android Wear in smartwatch terms, Garmin has attempted to make a connected sports watch that crosses into smartwatch territory. That makes the Vivoactive more useful when you're not out pounding the Tarmac or getting your guns sculpted at the gym. One of those introductions is Garmin Pay, a contactless payment system. The other is the ability to reply to messages, not just view notifications. The downside here is that there aren't any banks that support Garmin Pay in the UK yet, and Apple iOS restrictions mean that replying to notifications is limited to Android only. So, if you have an iPhone, you're stuck with fairly basic notification alerts. Apart from that, the Vivoactive is very much like other Garmin watches. A long press on the physical button reveals a round menu of options, including the ability to adjust the screen brightness, disconnect from your phone, switch on do not disturb (DND), save your GPS location, find your phone, lock the screen, and power the device off. From the main watch face, swiping up or down on the screen or touch-sensitive edge scrolls through the widgets. This is where you view at-a-glance information from a selection of pre-installed "apps". It includes the likes of upcoming calendar events, weather, activity/fitness progress data, music controls, heart rate and notifications. You can customise which appears here using the Garmin Connect app on your smartphone. Of course, you can customise the watch face somewhat as well, by just long-pressing the touchscreen and tapping "watch face". There are only a handful of preset watch faces installed, but you can tweak them to suit your style. However, if you choose to create your own there are a tonne of options from which to choose. You can select your general watch face style, then choose different hand styles, which data you want displayed in the complications, as well as selecting preferred accent colour. Before getting to the more nitty gritty details of performance, it's worth highlighting the best element of using the Vivoactive day-to-day: battery life. While you don't get the two-week battery performance of its older, bigger family members, you still get a lot more than an average smartwatch. In our testing, using it day-in day-out, tracking sleep and taking it on three 5km-ish runs, we got to the end of sixth day before it hit below 20 per cent. At this point we plugged the Vivoactive in to recharge, but it would certainly have made it through the next day if our anxiety could handle living with a watch indicating just 10 per cent battery was left. In short, you can easily make a weekly tradition of plugging in the watch to recharge it. Unless you run a half marathon every day! Other parts of its performance are just as impressive. GPS and heart-rate tracking numbers are consistent with other Garmin watches we've tested, showing similar results to those measured by the Apple Watch and Samsung Gear Sport. Although, interestingly, compared to both of those watches the Vivoactive measured slightly shorter distances. Testing it against the Gear Sport on three separate runs, we ran a route we've been using with the Apple Watch for several weeks. On this particular run, the Garmin consistently measured around 50 metres less overall. It's not a big difference in the grand scheme of things, and in its testing, on the same route which we ran multiple times, it measured the distance to be the same each time. So it was consistent. Looking at a traced route afterwards and it's clear that it's accurate in tracking. It didn't show us as running through houses at all, which some GPS devices can do when they don't register positional data often or aren't accurate. The Garmin's trace stuck pretty accurately to the paths and roads we used to test it on. There are a couple of performance elements we'd like to see improved. The first is how long it takes GPS to be ready. Like several other devices we've used, it can take anywhere between 10-30 seconds for the watch to lock onto its location before you can start your activity. It's not a deal-breaker, but it can mean standing still in the cold for longer than preferable. Secondly - and this is something we've found on virtually every single wrist-based heart-rate monitor - it would be nice if there was a heart-rate tracking system that worked well during indoor HIIT/kettlebell workouts. The Vivoactive 3 either loses track of the heart rate, or measures it as being much lower than it is in reality. One other disappointing issue we found was in general connectivity. Using the Garmin with an iPhone (running iOS 11), there were a few times each week when we'd check the app to find the watch no longer connected, which meant it wasn't updating the app, and wasn't pushing through notifications to the watch. The only fix we found was to reboot the iPhone. One other absent feature - which is found in the higher-end Garmin devices - is a performance condition feature that helps gauge how much fitter you're getting, or how long you should rest for before attempting your next workout. The Vivoactive didn't show us this at all, and that's something we found key in ensuring we took the proper rest between running sessions. For years now, Garmin's core audience has been the "serious runner". With the Vivoactive 3, and the continuous improvements made to the Connect app and the features added to watches, we sense the company is trying to shift that slightly. The Connect app has had a bit of an overhaul to the main interface, turning it into a card-based system designed to show your data. Only relevant cards show up to inform you of your activities for that day on the top of the first screen, then previous days' roundups are showed in cards beneath that. This data includes any steps counted, heart rate averages, stress monitoring (based on heart rate), sleep, calories, weight and floors climbed. We love that Garmin Connect has the ability to track 16 different types of activity and isn't just for runners. It's a true all-rounder. This includes strength and cardio training, as well as swimming, elliptical training, treadmill, rowing, biking, as well as indoor machine-based tracking for running, biking and walking. We think the best thing about the app, however, is that it gives you both the basic overview for everyday statistics, but also the depth and detail you'd want from a proper sports watch. You can dig into insights showing you how your VO2 Max is improving, see detailed information on your sleep pattern, running, heart rate and much more. While Garmin Connect shows the watch's strength as a sports tracker, it also shows the reason why it can't be considered a true smartwatch. There are virtually no native apps for popular services like social networking, banking, or anything for which you'd typically use a smartwatch. 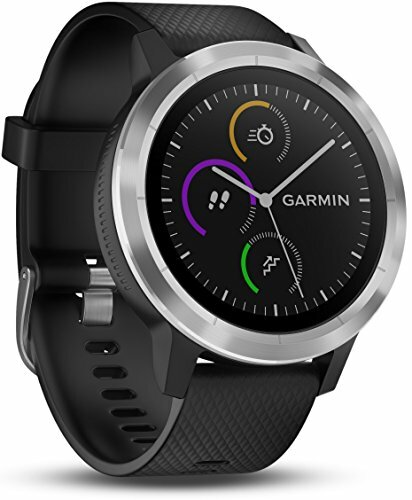 In the Vivoactive 3, Garmin has tried to build a device which is predominantly an everyday, normal persons', lifestyle-focused fitness watch. Think of this as more competition for your high-end Fitbit than a "serious running watch for serious runners". With just one button control, the Vivoactive 3 is more useful as a smartwatch than previous Garmin devices, thanks to the ability to reply to messages (at least with Android devices). It works just as well as a daily watch and activity/sleep tracker as a bog-standard Fitbit might, except that it so just happens to be equipped with all the elements you'd expect from a multi-sport tracker as well. The Garmin Vivoactive 3 is just as comfortable being a high-end activity tracker as it is being your daily fitness tracking wearable. In this regard, it's one of the most versatile smart fitness watches around. It's not perfect, but it is very good - and for a cut of the price compared to Garmin's highest-spec devices. If you're an Apple user then the company's own wearable is the best suited - for both sports, fitness and notifications. The third-gen is good for swimming and lasts long enough for a single running session within a day - but you'll need to be ready at the plug daily with this option, unlike the long-lasting Garmin. Fitbit's smartwatch-meets-fitness-watch finds itself sandwiched in-between the Garmin Vivoactive and Apple Watch proposition. It's got a more beautiful screen than the Garmin, while including the built-in GPS and swim functionality that the company's earlier Blaze was lacking.